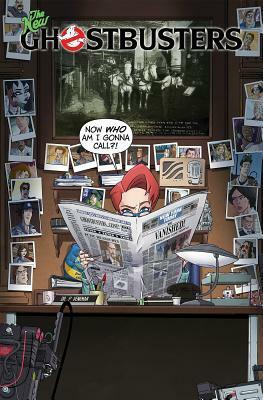 Like so many graphic novels today, this is a reprint collection of IDW’s monthly Ghostbuster comic book series. I’m going to start with the art — it IS a graphic novel, after all. The artwork takes on a very cartoon-y look — much like a 1990’s Saturday morning television cartoon. At the start, I was really put off by this, but as I got in to the story a little more, it bothered me less and less. However, it never really felt consistent — a panel here and there, a character, suddenly there would be something that just didn’t look ‘right’ (or have the same ‘off’ look as the rest) and I’d cringe a little bit. If I were to pick up this book or the comic off the shelf at my local store and just flip through it, I’d probably pass on it — there just isn’t anything about the art that makes me WANT to look through it, even though the art is appropriate for this kind of story. As to the story…. While this is labeled as “volume one” there has clearly been some kind of story line before this (and all TOO clearly, there will be more). I Don’t know who any of these characters are. They don’t look a think like the characters from the movie I remember. Fortunately, the goal of ‘busting’ ghosts is still the same, and the crazy contraptions seems to be the same. This series starts off with the regular Ghostbusters (whoever they are) getting sent off to a different dimension and some big baddies terrorizing the city. Some of those who have a connection to the Ghostbusters are asked to step up and take on the ghost-fighting position. Someone who had apparently been connected to the team but was sent to prison is released and is part of the team. These “new” ghostbusters are actually a pretty interesting team — their spirit and zest are written in such a way as to remind me of Ackroyd, Murray, Ramis, and Hudson and would probably have been better off without the inmate character. He seemed to be the buffoon that the art style was created for. Stylistically, the story might also have been much more interesting if we did NOT see the other dimension that the ghostbusting team was sent to. Those sections were a drag on the more interesting story with the new, impromptu team. If you should decide to read this book, you must go in to it realizing that it is an on-going comic serial and that there is no real conclusion. Anyone who has read more than a few of my reviews will know that I do NOT like books that are not complete stories. I’m all for leaving the audience/reader wanting more, but not at the cost of not writing a complete story. Most likely, if you are interested in reading this series, you are willing to wait and buy the graphic novels because it’s less expensive (I assume) and you can read four issues at a time, but think of the graphic novel as a semi-regular comic with on-going story. Over-all…I was surprised that the story captured my attention. I liked the new characters. The art grew on me. Looking for a good book? If you’re okay with cartoons, this is not a bad start to a series based on an iconic movie.